Happy June! 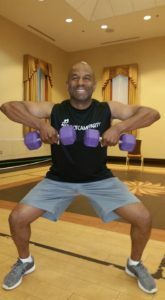 Introducing the Boot Camp Party member of the month of June: Derwin Pearsall! This brother right here hit the ground running when he and his wife Tina first joined boot camp several months ago, and has been the life of the party ever since. He keeps me motivated! “My wife introduced me to Dion’s class, and it was one of the best decisions she ever made for me. The class is fun and energetic, but Dion uses his contagious personality to challenge you. His class is a great mix of cardio, strength, and stretching exercises designed for people of all fitness levels. Dion welcomes you to his class, and the other members of the class will also motivate you when you hear their journeys. Congratulations Derwin! Proud of you!